I was given some Rowan Cashsoft DK in Sweet (that really is the colour name) and decided to make a Liesel scarf for a friend. The grafted section does not like quite as good as I hoped, but I think it is OK. 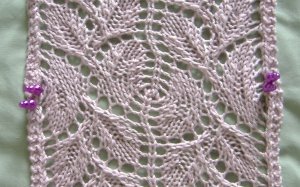 I considered stopping each half 2 rows before the end of the pattern repeat to make that section shorter, but that would cause problems with the purled centres of the leaves. I used 4.5mm needles, and the scarf took 132g (375 yds). 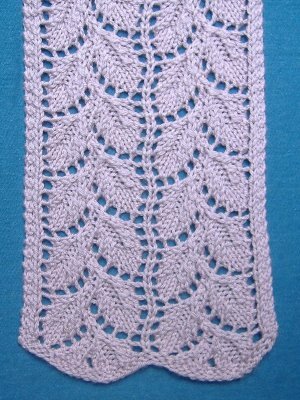 The scarf was blocked to 7.25" wide and 77" long, but shrunk to 6.5" by 72" once unpinned and allowed to relax. 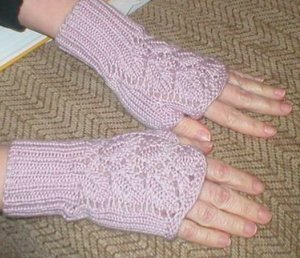 Even though my friend likes long scarves, I thought that was plenty long enough, but I still had some yarn left, so I decided to make some fingerless mitts to match. 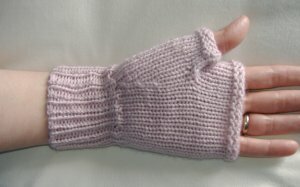 I knitted them 'top down' to use that nice curved edge over the back of the back of the knuckles. I did them on 4.00mm Brittany dpns, as I thought they needed a firmer gauge. My friend's hands are smaller than mine so they should fit her a little better.without the cuff creeping over the base of the hand. 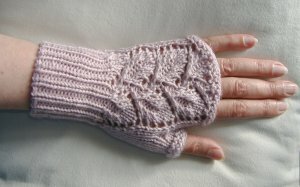 I did the thumb gusset slightly towards the palm - you can see the shaping better on this picture, which also shows that the 'straight across' top on the palm side doesn't interfere with bending the hand, while the curved top on the back gives a bit more protection to the fingers. They only took 30g (85 yds) of yarn for the pair.